Gary Hamilton paid tribute to the Glenavon players and coaching staff after Saturday’s emphatic win over Coleraine. The Lurgan Blues boss, who had laid his grandfather to rest 24 hours earlier, admitted the last few weeks had been tough for him. 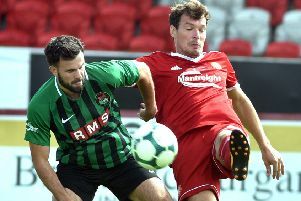 But he has been overwhelmed by how the club as a whole has rallied round him as the team continue to set the pace at the top of the Danske Bank Premiership. “I want to thank the boys, it has been a tough week for me personally, tough month never mind week,” said Hamilton after the game. “The boys went out and did my Granda proud today. “I know for sure he’ll be following Glenavon for the rest of his life from the skies. “He was buried yesterday, the performance the boys put in was testament to them. “Sometimes you talk about things in football, but today meant a lot to me, from the players to the coaching staff, and it would have meant a lot to my Granda too. “Anyone that knows me knows that I was probably closer to my Granda than I was to my parents at times. “He was someone who was very, very close to me, and this has hit me very hard. “There’s no point glossing over things, that is fact. “The players and the coaching staff have done my Granda proud today. “Sometimes things like this happen. “The day after Mark Farren’s funeral we went out and beat Glentoran 4-1 and Ciaran Martyn scored in the 10th and 18th minutes. “Some times things are meant to be. “My Granda has been ill for the last couple of years it just happened to be he passed away this week, the week we play Coleraine. “Coleraine haven’t been beaten in so long and we go and win, sometimes you just think your path is set out for you. Stephen Murray scored a Glenavon hat-trick alongside a goal for Rhys Marshall. Coleraine boss Rodney McAree pulled no punches when giving his assessment of the game. “The better and hungrier team won,” he said after the match. “Glenavon asked the most questions and we could have maybe gone in further behind at half-time. “We probably scored our goal against the run of play but, to be fair, it was great work by Darren McCauley and a good header by Aaron Burns. “You find yourselves 1-0 up and we probably didn’t manage the game well enough. “The first goal was a poor one to concede and we could have done better with it. “The second comes straight from the kick-off so it’s a case of we make a poor decision in the centre of the park and the ball ends up in the back of the net. “I thought for the first 15 minutes of the second half we were very good. “We played higher up the park, we were brave and we managed to win more headers and more territory. “I thought we were going to equalise at that stage but, again, it’s a poor decision that kills us. “We should put the ball into the box for their third goal and we try to be clever and it ends up at the other end of the pitch on the counter and the game’s dead and buried at 3-1 down. Coleraine: Johns, Harkin (McLaughlin, 63), McAuley, Lowry, McConaghie (Mullan, 63), Burns, O’Donnell, Parkhill, Traynor, McGonigle (Gawne, 71), Canning. Subs (not used): Doherty, Douglas, Crown, Owens. Subs (not used): Harmon, Larmour, McCloskey, Muir.